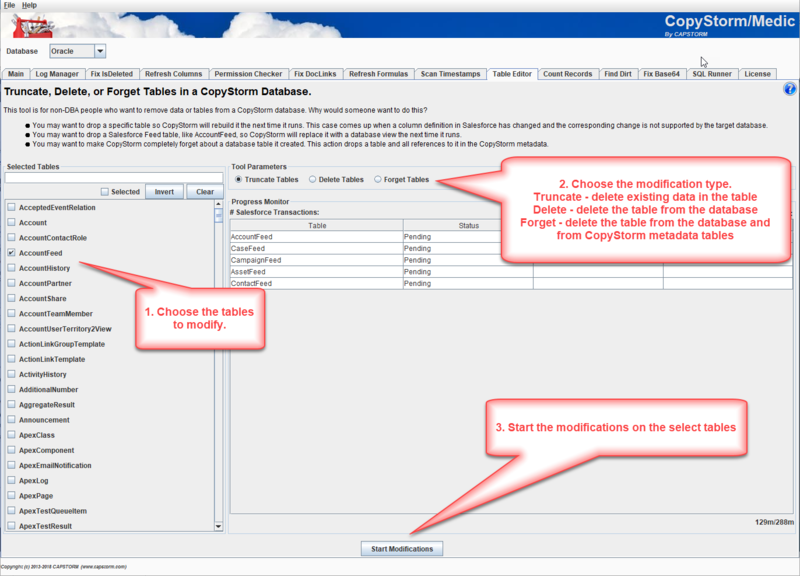 The CopyStorm/Medic Table Editor tool is for non-DBA people who want to remove data or tables from a CopyStorm database. Why would someone want to do this? You may want to drop a specific table so CopyStorm will rebuild it the next time it runs. This case comes up when a column definition in Salesforce has changed and the corresponding change is not supported by the target database. You may want to drop a Salesforce Feed table, like AccountFeed, so CopyStorm will replace it with a database view the next time it runs. You may want to make CopyStorm completely forget about a database table it created. This action drops a table and all references to it in the CopyStorm metadata. Without the Table Editor tool a DBA can always manually truncate or drop a table — this tool is designed to provide a way for a non-DBA to perform the same task. The side of the dialog is used to select the tables to truncate, delete, or forget.. The top part of the dialog determines if the selected tables will be deleted, truncated, or forgotten. The lower part of the dialog displays the progress of table modifications. The Table Editor tool cannot be run as a batch job.